What a strong week for new releases! We’ve got a classic adventure game in a spiffy new edition, the return of a racing game series based on a childhood toy, a sequel to a fun digital card game, several digital board games, a zen-like new puzzle game and even a Batman game! 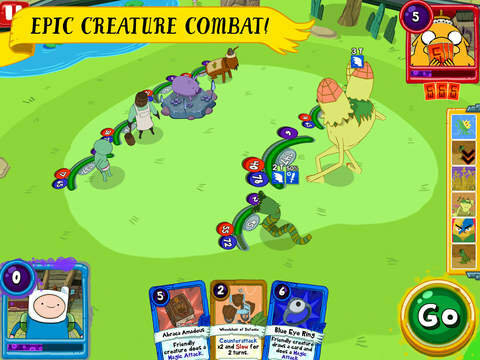 Cartoon Network and Kung Fu Factory have released a stellar new sequel to 2014’s Card Wars card battling game. Card Wars Kingdom is a completely free-to-play sequel which streamlines the rules, eliminates the awkwardness of the lane-based system and the randomness of the attack wheel spinner, making for a much more enjoyable and strategic experience. For those familiar with the original, as I said, the lane based system is gone, so now fighter cards are no longer restricted to certain lanes, all fighters can be deployed to the battlefield at will. Each fighter on your team (of up to 5 fighters, with four fieldable at a time) has their own deck of cards and you get a card from that fighter’s deck each time you perform a drag-attack with them. These cards can be used on any fighter regardless of the faction/land they are from. Instead of lanes, the lands are now cards and when played on any fighter they provide special land abilities to the fighter sitting on top of them. Each fighter has a magic attack stat which can be triggered by playing certain cards. You also can no longer “floop” individual fighter cards, but instead you build up a floop meter which automatically floops your hero/player when full. Each hero has their own deck of super powerful cards (with zero cost to deploy) and you get a random one of these when the hero floops. I definitely prefer this one over the original, however, as expected, it is still quite a bit of grinding to build up your health meter and unlock/upgrade new fighters and the free-to-play mechanics can feel a bit daunting with a whole pile of currencies including gems, cake, bones and a pantry full of ingredients. Still highly recommended. Batman: Arkham Underworld is a neat new free-to-play offering by Warner Bros. which sort of falls into that popular Clash of Clans genre, but with an engaging story-based mission system and much more appealing theme . It also features loads of iconic characters and locations from the Batman universe. However, instead of siding with Batman, players actually take on a more insidious role as they recruit DC Comics super-villains and try to become Gotham City’s next criminal mastermind. 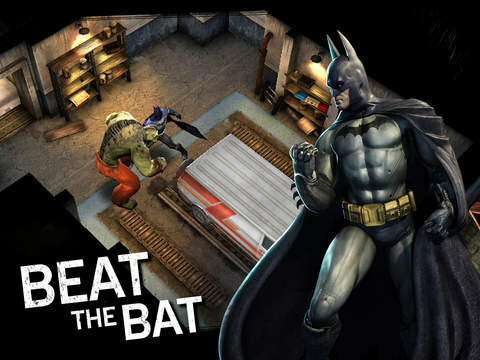 “Take control of Batman’s greatest enemies in intense PVP action as players work their way up the criminal underbelly of Gotham City to build a powerful army of thugs and vie for control of the city”. Grow your empire and create the ultimate hideout, which you’ll then have to defend from “other aspiring crime lords”. I’m not a fan of Clash of Clans (or really that whole genre), but I’ve played a little of this, and so far the theme and story-driven nature of the game made it quite enjoyable. I think Batman fans are definitely going to want to check this one out. I can still picture those fast-talking TV commercials for Micro Machines starring John Moschitta. Now Codemasters is rebooting their game series based on these popular toys which first appeared in the early 90s. 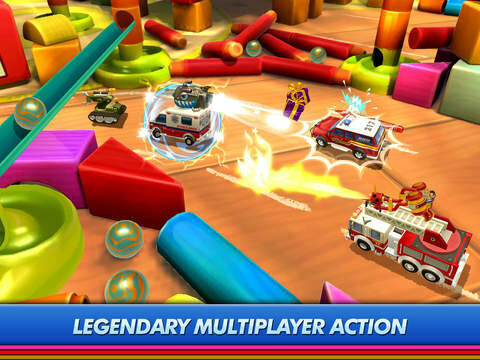 Micro Machines is a new free-to-play racing published by Chillingo. Players start with one vehicle and then race on crazy tracks made from “breakfast tables, desktops, pool tables and kitchen sinks” to earn money to buy random part packs, which contain some pieces of Micro Machine vehicles (63 cars in all). Players can use the pieces to try to build and upgrade their very own Micro Machine collections. The game plays very much like a typical kart racing game where you race along a track and can periodically run into floating boxes which give you a random power-up which can be used to take out a competitor or to help you get ahead in the race. A first for this game series is the inclusion of battle mode where vehicles can use NERF blasters to try to take out their competition. There are three game modes in all: Race, Battle and Elimination as well as Daily Goals and Rewards to help you earn in-game currency and parts. If you can get past the usual free-to-play nonsense, I think younger kids will enjoy this one. We continue the collectible theme with Combo Critters, a cute pixel art, casual monster battling game from Lucky Kat Studios. Players explore planets, collecting and combining critters to discover new and more powerful species which can be used to battle the planets’ local inhabitants. Each character has a health and attack stat. Battles consist of a simple matter of selecting which of your team of three characters you want to attack with. Once the same creature has been used to attack three times in a battle, it charges their special attack which when triggered, runs the player through a rapid sequence of three gesture based minigame puzzles, which if completed quickly and correctly, do extra damage to your foe. When you win a battle you then have a chance to try to add the fallen creature to your collection. Next up is a new puzzle game from Maciej Targoni, the creator of the App Store hit, Hook. 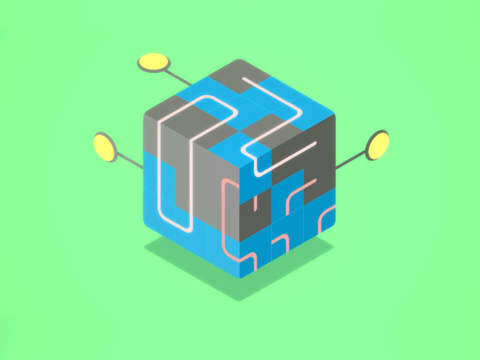 “klocki” is a zen puzzle game where you are swapping around pieces on geometric shapes to construct patterns and complete paths. There seems to be quite a few levels in the game. There are several things that I really love about this app: there are no timers, no stars and no move counters, you just get to take your time and solve the puzzles. You start out with some basic swapping and then new puzzle elements like rotating tiles, three-dimensional shapes and more start getting introduced at a nice speed to keep the puzzles from getting too repetitive. Klocki is a fun way to keep your mind engaged, while having a little relaxing downtime. 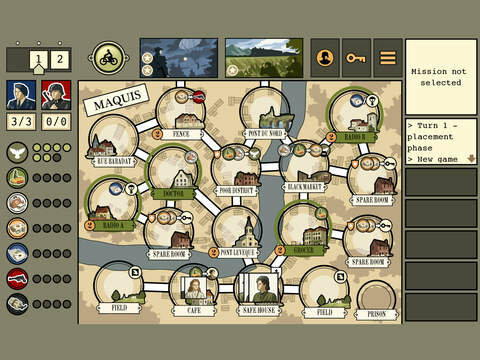 Maquis Board Game is a challenging little solitaire, worker-placement game. The goal is to complete two missions before the end of 14 days, or before the townspeople’s morale drops so much that they give into their oppressors. The cool thing is that there are a number of goals of varying difficulties to choose from. So you can adjust the difficulty to suit your skill level. There is a video tutorial within the app to get you going as well as a lit of tips for new players. It feels a bit puzzly and satisfying and great for when you want to satisfy that worker placement itch, but don’t have anyone around to play with. Plus the variety of missions allow for some nice replayability. 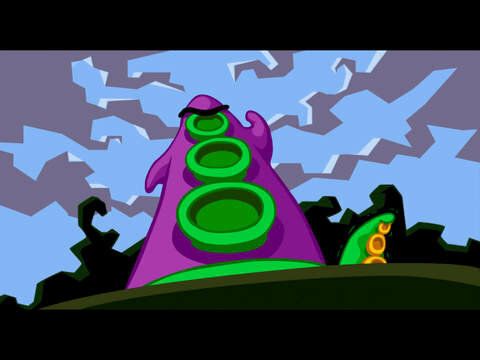 Double Fine Productions (The Cave, Broken Age, Grim Fandango Remastered) has just released an iOS version of their gorgeously remastered edition of the cult classic, comedic, point-and-click adventure game Day of the Tentacle. Originally released by LucasArts in 1993 Day of The Tentacle is the sequel to Ron Gilbert’s award-winning 1987 adventure game Maniac Mansion. This beautifully remastered edition features all-new hand-drawn, high-resolution art as well as remastered audio, music and sound effects. A time-bending adventure. Dr. Fred’s evil mutated purple tentacle is trying to take over the world, and it is up to three friends a nerdy young man name Bernard, a stoner named Hoagie and girl named Laverne to stop it. The trio has access to some time machines, unfortunately each is malfunctioning due to a lack of power and just so happen to be trapped in a different era of time. Hoagie is stuck in the 18th century, Bernard in the current time and Laverne is in the future. Fortunately they can pass items to one another by flushing them into the toilets in their time machines. This “Remastered” edition features a slick new touch-based UI that works well on mobile devices. However, if you are feeling nostalgic, you can easily switch back and forth between classic and remastered modes at will…jaggies and all. There is also an optional, but fascinating commentary track which can be enabled, which features the game’s original creators Tim Schafer, Dave Grossman, Larry Ahern, Peter Chan, Peter McConnell and Clint Bajakian. You don’t need to have played Maniac Mansion to enjoy this title and despite its age, the game holds up very well and has honestly never looked better. I played both Day of The Tentacle (and Maniac Mansion) when they were originally released so this remastered edition is a real treat. I certainly hope that Maniac Mansion gets a similar treatment sometime in the future because it was great too experience this classic again and see it get such a deluxe treatment. Finally that brings us to Police Precinct: Online, a successfully Kickstarted digital adaptation of Common Man Game’s popular thematic cooperative board game. Somehow I completely missed this one’s launch on July 6th, so I wanted to make sure I brought some attention to it now. I haven’t had the opportunity to play the physical game before, but have heard so many great things that I was excited to be able to check out A.C.R.O.N.Y.M. Games’ digital adaptation. In Police Precinct, players take on the role of police officers, patrolling the streets of town, collecting the evidence to necessary to solve a high-profile murder case before crime in the city escalates too high. Find the murder weapon, interview witnesses, explore the crime scene for evidence and examine the body for the cause of death. However, crime doesn’t just stop because you are investigating a murder. You have to keep an eye on street punks and arrest them before they form gangs and deal with all sorts of other emergencies that will constantly be coming up. 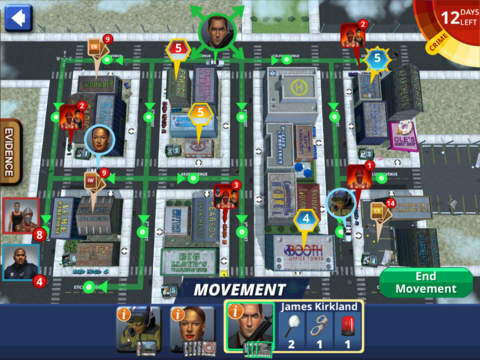 Each player’s turn is performed in four phases, first you move your vehicle, then in the action phase you can perform one of the following actions: investigate the murder, conduct an arrest, handle an emergency, upgrade your character or draw a police card. Then you draw a police card and finally draw an event card which has the potential of adding an additional emergency onto the board, more punks onto the board or something else that your already strapped police force will have to deal with. 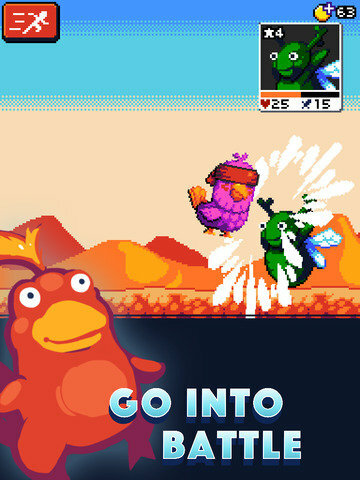 The app supports up to six players with both online asynchronous play and local pass and play. There are loads of options for customizing your game experience from a choice of 6 difficulty levels and options for selecting the number of starting emergencies, punks on the board, punks in the supply, starting crime track level, the number of days you have to solve the murder, and support vehicle toggle. Perhaps I missed it, but it appears as if the “dirty cop” variant from the physical release where one player is a hidden betrayer, was not an option within the app. 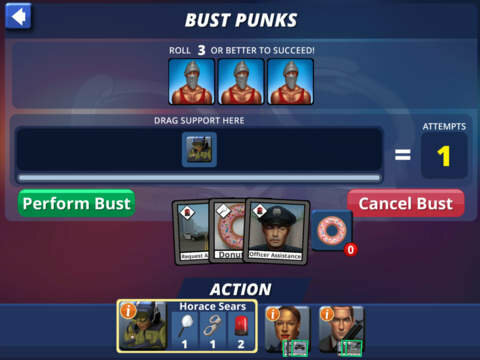 The minimum number of police is two and there are are no AI players, so if playing solo, you’ll have to take control of multiple police officers. Police Precinct: Online is a challenging and fun game with a great, well-integrated theme. Not being familiar with the tabletop version, there was a little bit of a learning curve, especially since the app lacks an interactive tutorial. However, there is a twelve-part ‘How to Play’ section broken down into the key aspects of the game as well as links to several third-party instructional videos and a PDF of the full rule book for the game, should you have any questions. Overall I’ve found Police Precinct: Online to be a well-designed app and once I get a few more solved murders under my belt I’m looking forward to checking out the online play. If you’ve been curious about the game, but don’t have the money for the physical release sight unseen, this is a great way to check it out less inexpensively before you buy.